For a PDF of this factsheet, please click here. The Washington State Legislature has the chance in the winter 2018 session to pass an updated equal pay bill. In each of the past three years, the state’s House has passed an equal pay bill with bipartisan majorities, but those bills have died in committee in the Senate. With Senate committees under new leadership, the fourth effort could be more successful. 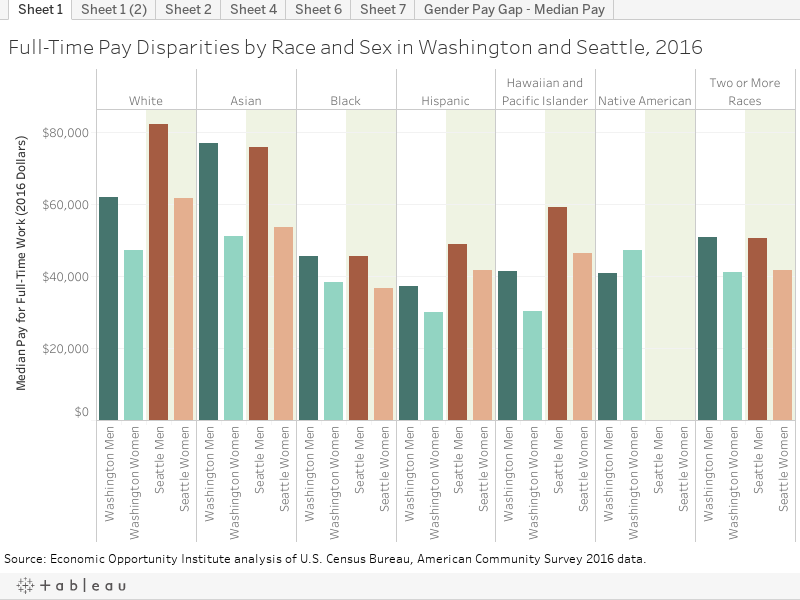 Recent advances in Washington will help reduce the gender wage gap, including the new pregnancy accommodation law that took effect in July 2017, the paid family and medical leave program that will begin in 2020, and the voter-approved initiative that raises the state minimum wage and institutes paid sick and safe leave statewide in January 2017. And allowing the state to investigate and rule on unfair pay practices, in addition to the right for workers to sue in court and recover damages and costs for discrimination. HB 1506 passed in the House 61 to 36 in 2017. HB 1646 passed 55 to 43 in 2015 and 56 to 41 in 2016. See Washington State Legislature, Bill Histories, http://app.leg.wa.gov/billsummary?BillNumber=1506&Year=2017, http://app.leg.wa.gov/billsummary?BillNumber=1646&Year=2015. Revised Code of Washington 49.12.175, https://app.leg.wa.gov/rcw/default.aspx?cite=49.12.175; and U.S. Equal Employment Opportunity Commission, “The Equal Pay Act of 1963,” https://www.eeoc.gov/laws/statutes/epa.cfm (website viewed 1/4/2018). U.S. Census Bureau, American Community Survey, S2001 Earnings in the Past 12 Months (in 2016 inflation-adjusted dollars). Institute for Women’s Policy Research, “Projected Year the Wage Gap Will Close by State, March 22, 2017, https://iwpr.org/publications/projected-year-wage-gap-will-close-state/. American Association of University Women, Equal Pay laws by State, 10/25/2017, https://www.aauw.org/aauw_check/pdf_download/show_pdf.php?file=Equal-Pay-Laws-by-State. U.S. Census Bureau, Quarterly Workforce Indicators Explorer, https://qwiexplorer.ces.census.gov/static/explore.html. This data set allows analysis by state, county, firm and worker characteristics. U.S. Census Bureau, American Community Survey, Tables S2411 and S2401. SJ Glynn, “The Top 10 Facts About the Wage Gap,” Center for American Progress, 2012, http://www.americanprogress.org/issues/labor/news/2012/04/16/11391/the-top-10-facts-about-the-wage-gap/; Francine D. Blau and Lawrence M. Kahn, “The Gender Pay Gap: Have Women Gone as Far as They Can?” Academy of Management Perspectives, 2007, Feb.: 7-23; Hoobler, et al, “Bosses’ Perceptions of Family-Work Conflict and Women’s Promotability: Glass Ceiling Effects,” The Academy of Management Journal, vol. 52, no. 5, October 2009, cited in Strategy-Business, “Gender Inequality: How False Perceptions Affect Promotions,” http://www.strategy-business.com/article/re00069?gko=b8a0d. 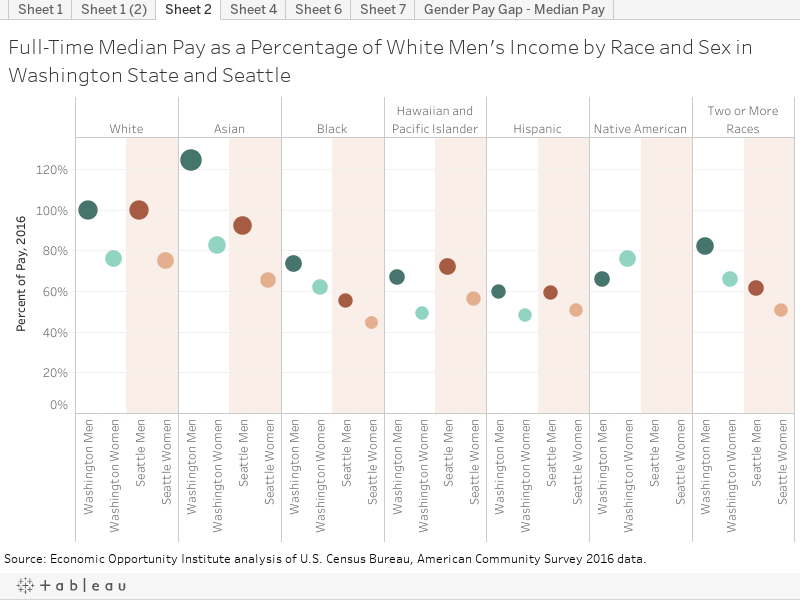 M Diamond, “Study: Women Ask for Raises and Promotions as Often as Men, But Get Less in Return,” Think Progress, 2012, http://thinkprogress.org/economy/2012/01/10/401419/study-women-raises/; J Hoobler, S Wayne, G. Lemmon, “Bosses’ Perceptions of Family-Work Conflict and Women’s Promotability. Academy of Management Journal, Vol 52, no. 5, Oct 2009, https://www.strategy-business.com/article/re00069?gko=b8a0d. Marilyn Watkins, “New Rights Help Working Families Thrive,” 12/15/2017, Economic Opportunity Institute, http://www.eoionline.org/blog/new-rights-in-washington-help-working-families-thrive/.